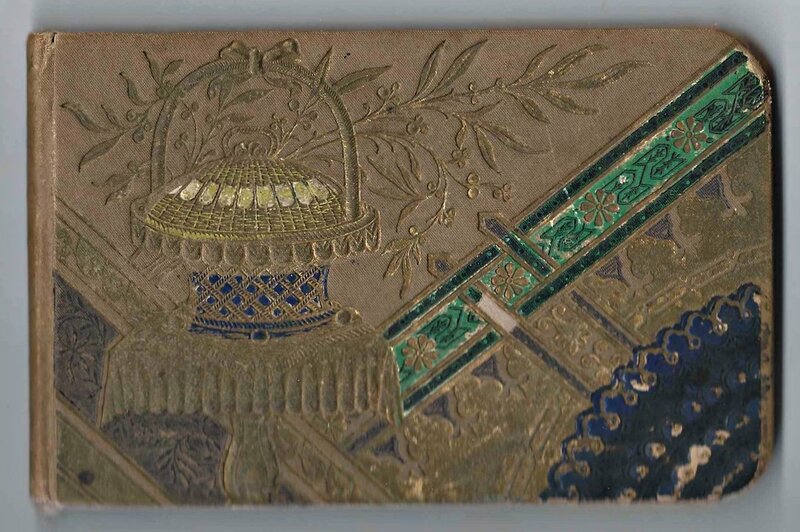 1890s autograph album that belonged to a Willie of Montoursville, Pennsylvania. 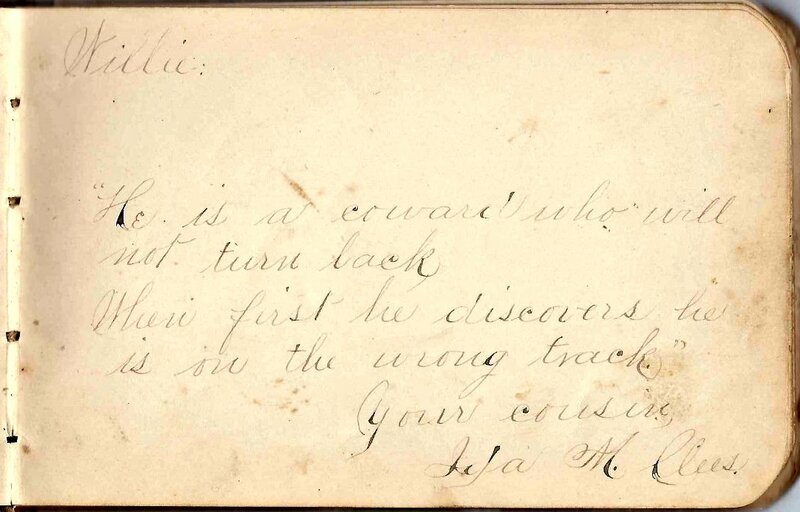 From clues in the album, I believe he was William H. Clees. 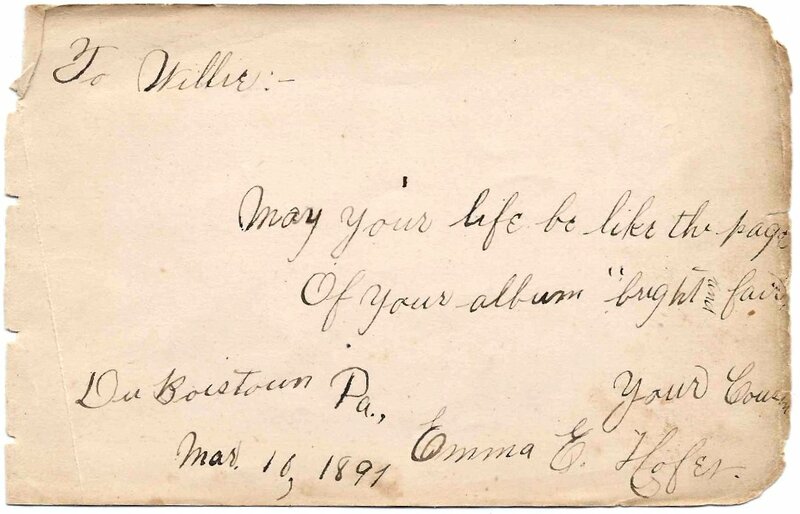 The album is approximately 6-1/4" x 4" and contains 30 pages signed by Willie's relatives, schoolmates, teachers and friends. An alphabetical list of the signers appears at the end of this post. Assuming that I have the correct Willie, William H. Clees was born about 1876, possibly at Fairfield, Pennsylvania, the son of Charles and Hannah (Heist) Clees, who were both natives of Lycoming County, Pennsylvania. Willie's paternal grandparents were Frederick J. and Hannah (OBourne) Clees. His maternal grandparents were John and Christianna Heist. 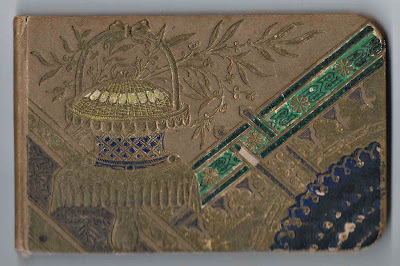 On 6 March 1909 at Montoursville, Pennsylvania, William married Ora Amelia Northrup, daughter of Fanton Llwellyn Northrup and Ida Jane (Burt) Northrup. 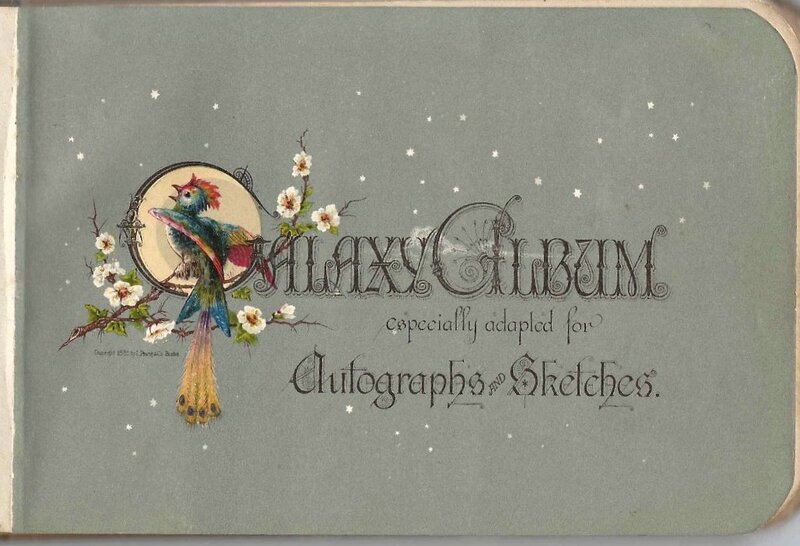 She was born, I think, on 6 March 1884. 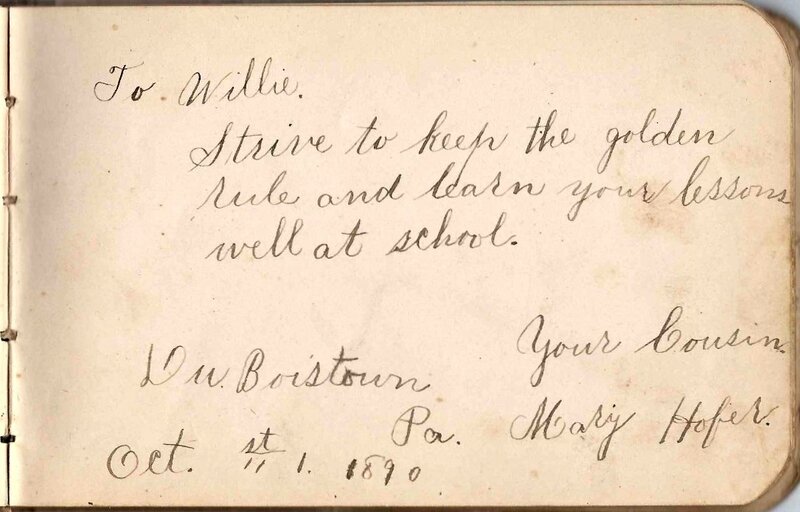 William and Ora raised a family of at least two children at Montoursville, Pennsylvania. They lost their son in the waning days of World War II, possibly in the Battle of the Bulge. 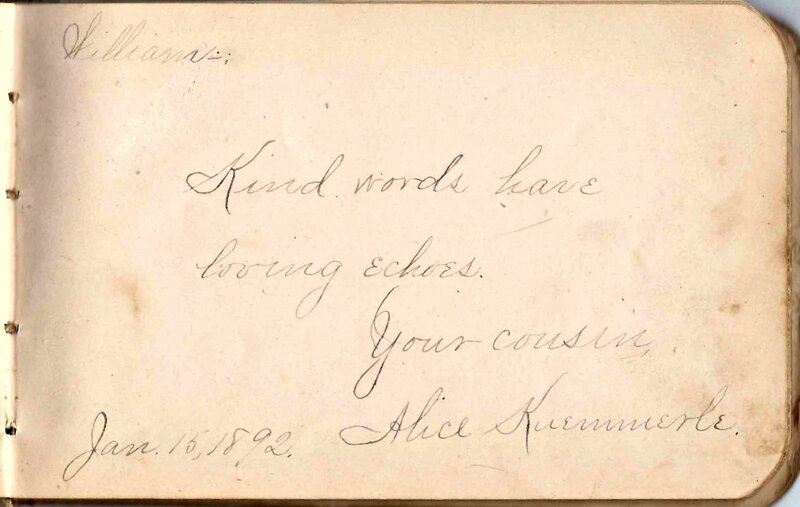 Five signers indicated on the pages that they were Willie's cousin. 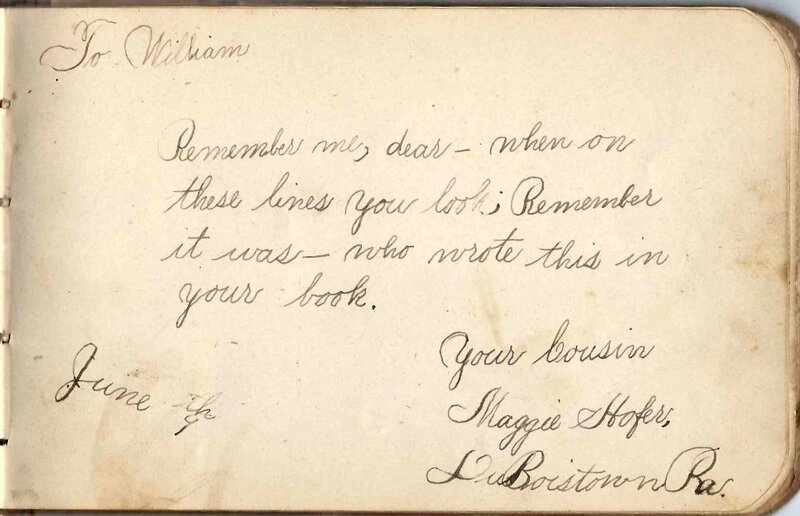 Siblings Mary, Maggie and Emma Hofer of DuBoisville, Pennsylvania, signed pages. They were the daughters of Gottfried Frederick Hofer and Catherine "Katie" (Heist) Hofer. 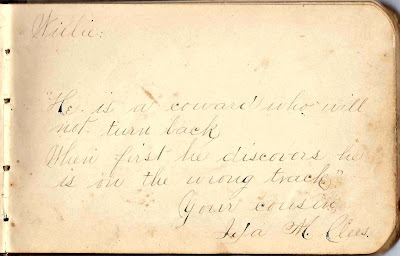 Cousin Ida M. Clees signed a page. She was the daughter of John Henry Clees and Sarah J. (Tomlinson) Clees. 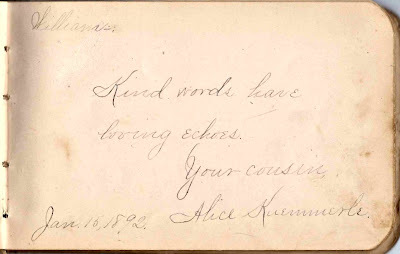 Cousin Alice Kuemmerle signed a page on 15 January 1892. She was the daughter of Gottlieb and Christiana Kuemmerle. If you have corrections and/or additions to the information above, or information on any of the signers below, please leave a comment or contact me directly. 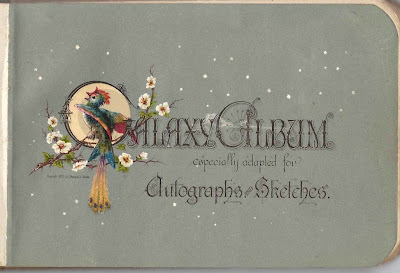 I. W. Breon of Montgomery, Pennsylvania, signed on 11 December 1894; first initial could be J.
Willie Clees of Montoursville, Pennsylvania; album owner William H. Clees, son of Charles and Hannah (Heist) Clees. Ida M. Clees; Willie's cousin. Ida was the daughter of John Henry Clees and Sarah J. (Tomlinson) Clees. 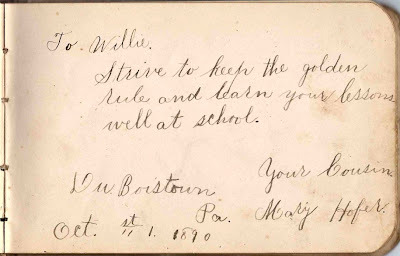 Mary Hofer of DuBoistown, Pennsylvania, signed 1 October 1890; Willie's cousin. She was the daughter of Gottfried Frederick Hofer and Catherine "Katie" (Heist) Hofer. 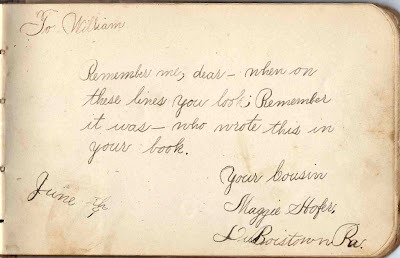 Maggie Hofer of DuBoistown, Pennsylvania, signed 9 June [no year]; Willie's cousin. She was the daughter of Gottfried Frederick Hofer and Catherine "Katie" (Heist) Hofer. 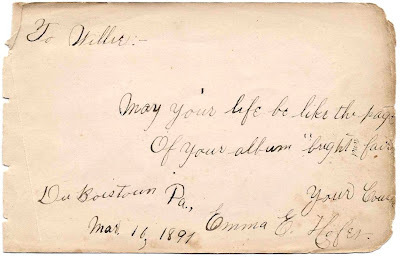 Emma E. Hofer of DuBoistown, Pennsylvania, signed on 10 March 1891; Willie's cousin. She was the daughter of Gottfried Frederick Hofer and Catherine "Katie" (Heist) Hofer.